Two years ago, in October of 2016, investors were uncertain how a Hillary Clinton presidency would affect the stock market and the American economy, and backed away from investing in a wait-and-see approach. Fast-forward two years and in October 2018, investors were uncertain what was going to happen in the mid-term elections (with special concern should Democrats take over the House of Representatives), whether the United States is ever going to have a new trade agreement with China, whether the decades-old nuclear deal with the Soviet Union is going to be erased, and how the balance between inflation and the federal interest rate will play out. Once again, investors chose to back away from extending their investments until a clearer picture of the American economy emerges. The Spectrem Millionaire Investor Confidence Index, which measures the confidence of investors with $1 million in investable assets, dropped 4 points in October to 3 after falling 13 points in September. 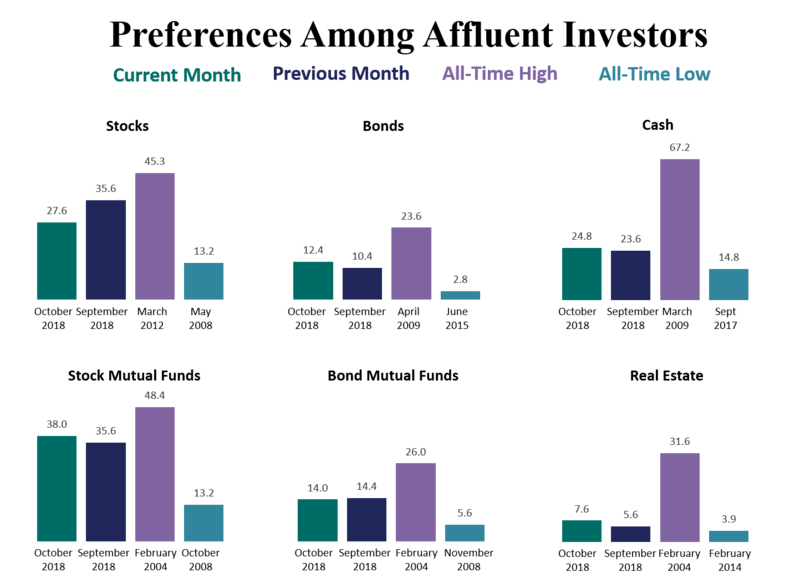 The Spectrem Affluent Investor Confidence Index, which measures confidence among investors with $500,000 in investable assets, dropped from 6 to 4 in October, and is higher than the Millionaire Confidence Index for the first time since May of 2017. The October fielding took place Oct. 19-25, during which the stock market lost 500 points overall and saw a one-day drop of almost 600 points. Also during that time, President Donald Trump expressed concerns about negotiations with China over a new trade deal and expressed dissatisfaction with the Federal Reserve’s handling of the federal benchmark interest rate. Many Millionaires switched their interest from Stock investing to Stock Mutual Fund investing, with a 4 percent drop in the former and a 5 percent increase in the latter. But Millionaires increased their Individual Bond investing to 17.2 percent, the highest percentage since February. Cash investing rose to 30.5 percent, matching the most recent high from October of 2017, an indication that they are extending their interest in the safety products. Non-Millionaires decreased their Stock investing by more than 12 percentage points to 22.1 percent, but also backed away slightly from Cash investing, down to 18.9 percent. The overall percentage of those Not Investing at a slightly lower 35.6 percent was balanced by an increase among non-Millionaires and a decrease among Millionaires. This is again an indication that Millionaires are still investing but doing so with less risk, while non-Millionaires are backing away. It is rare for men and women to agree on anything, but they both dropped their interest in Stock investing in October, both by about 10 percentage points. They also both increased Individual Bond investing. The Confidence Indices overall fell more for men than it did for women. In fact, among affluent women, the Confidence Index stayed the same. However, the male indices remain in positive territory while the female indices are both in negative range. October was a month where Democrats were more positive about their investment options than Republicans were. Democrats increased their investing in all categories, both in equities and safety products, and that included a 20-percent increase in those investing in Stock Mutual Funds. There was a corresponding 22-point decrease in Democrats Not Investing, an indication that they are involved in current conditions. Republicans decreased interest in Stock investing, Individual Bond investing, and increased those Not Investing, an indication of reluctance to be involved in the current market. The indices for both Millionaire and Affluent Democrats rose out of negative territory, while the indices for both Millionaire and Affluent Republicans fell, slightly in October. Working and retired investors are often at cross purposes in their investment strategies, but it is rare for the working investors to be hesitant to invest while the retired investors are gung-ho. However, in October investing in all categories except Stocks rose among retired investors, while investing in all categories other than Real Estate dropped among working investors. Both working and retired investors increased their level of those Not Investing. All overall indices fell among working and retired investors, and the Millionaire Confidence Index among retired Millionaires dropped 18 points to -20, the lowest mark ever.